Set along the dramatic and dangerous Anglesey coastline, The Charter is a story of greed and forgiveness - when the treasures of the past evoke the crimes of today. Overall I enjoyed this audiobook, but there are a few issues. There are a couple of backstories that just sort of peter out, the ghost story goes absolutely nowhere and the ending is an anticlimax. I also struggled with the “Canadian” accent. It wasn’t awful and I don’t feel like I wasted my time.... but it did feel like a first try. What made the experience of listening to The Charter the most enjoyable? The sense of place, with such swings from calm and peaceful to hugely dramatic and all related to the sea. A voice in full control of the material with a talent for switching voice pace to match srtory pace. What was one of the most memorable moments of The Charter? The original shipwreck, the tragic correlation of greed and death, echoes through the whole book. And the opening scene is a shocker - in a good way. The final scene is unexpected but exactly right. I had no idea how this would play out but felt fully satisfied by the conclusion. No. I needed time to think about what I'd heard and consider the meanings. Having said that, I was always eager to get back to it. It made me want to visit the location, see that coast and visit that church, to pay tribute to the real tragedy which sparked this story. Would you listen to The Charter again? Why? This is a complex, well crafted tale of loss, greed and the inevitability of fate. The author has brought together elements of different genres (family drama, murder mystery, thriller, ghost story, treasure hunt!) and set them loose on the rugged but beautiful coastline of Anglesey. This may sound like a bit of a muddle but Gillian Hamer has done a fine job of delivering a cohesive narrative.I particularly enjoyed the descriptive passages regarding the Welsh scenery, the stormy seas and the terrible sinking of The Royal Charter which casts it's shadow through the entire story. Catherine O'Brien has a soft, pleasant voice which suits the ghostly laments of Angelina and the narration of the tragedy well. However, she is not good at accents which can be distracting in a story such as this. I did get used to this though and found that it did not spoil my enjoyment of the last half of the book when the pace increased. There are lots of sad or tragic events in this story, but it is compelling and I did not find it depressing to listen to. I may,just to see if I missed anything. The Sarah telling the story. Sarah.Catherine O'Brien did a great job with the voices getting all the characters just right. I loved this book!The storyline was VERY interesting.The setting was perfect and the characters seemed real.The narrator,Catherine O'Brien did a great job with the voices making everyone a real person I cared about.I did get a bit confused with Louis vs Luke and Danny vs David toward the end.Maybe names with different beginning letters would help?Either way,I loved the story! The Charter by Gillian E. Hamer. Narrated by Catherine O’Brien. 12 hours, 59 minutes. Published May 4th, 2012. Smashwords edition. This book opens up in October of 1859. A strong storm has taken down a ship called the Royal Charter, along the dramatic and dangerous Anglesey coastline. Townsfolk come out trying to save as many as they can from the sinking ship. In the background a young girl, Angelina is speaking and waiting for the rescuers to save her. Speaks as if she is writing this all down in a diary. Then she comes to the realization she is dead. Still wanting for someone to hear her. Oh, please! Where was her mom and dad? Modern day, November, 2012, Sarah Morton returns home for her father’s funeral with her husband Dominic. A place she never wanted to return to. Right from the start her father’s solicitor arrives at the cemetery with a request for her to arrive at his office the next day. From the start and throughout the book is the complete secrecy of her father life after she left her home. Her father’s research into the sinking of the Royal Charter. For which there house is named after “The Charter House”. She always thought her father was a bit eccentric, especially after her mom past away. He had an obsession she thought of tracing the lineage of her family back to the island that they lived on. Coming to find items in her father’s safe and not telling her husband Dominic at to what the solicitor gave her or what she found. She was not sure that he would understand causing them to fight. Sarah telling him to just go back home and let her sort out her father’s estate. Waking in the morning Sarah thought he did just that. Went back home when he was not there upon her waking. Seeing his car there she thought he must have went for a run to cool off. That’s what he did she thought. After, many hours passing she went out to look for him. Maybe he was lost? However, Dominic was the first one to die. Was it an accident? Now Sarah wonders when the police stop by to pay their condolences for her father. Why would they do that? They mention death threats and other things that her father called and complained about. Now her mind starts spinning. Awe, book spoiler I think not! Sarah is sent on a treasure hunt that begins at the solicitor’s. Thinking she was there for the Will reading. Only to be sent back from a letter she was given to go to her father’s safe. Thinking the Will was there. Nothing there but another clue. As the story proceeds Sarah meets up with Isabel, her father’s assistant. Other characters within the story is an assistant detective, her childhood friend Luke, and her grandmother. Along, with a cast of other characters that are there to help her or try to stop or gain access to the information she has found. A true treasure hunt mystery. There is more than just Sarah and Isabel wanting to know where the gold that is hidden as indicated by some of the clues each step they found. I really feel that the book and the events in it do justify the long audio of nearly 13 hrs. Gillian really draws an attention to the details of the characters and keep track of the mystery itself. Intertwining the past as Angelina tells of events that are occurring during the early 1860’s. How she appears to Sarah throughout the book. A helper in a way. Sarah does not tell no one so they do not think her crazy until she does met Isabel. I can’t say that the scenes are all predictable but, most are. When you think you have it figured out, you don’t. I was kind of surprised by the ending. I love in the epilogue that Gillian give that “I knew that was going to happen!” She gives what I want to call a soft touch to the ending. 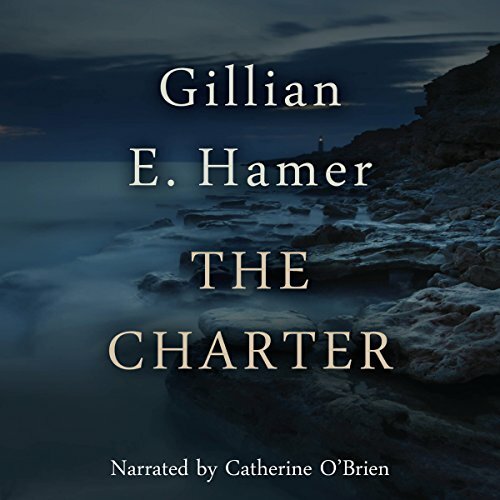 The Charter narrated by Catherine O’Brien was well acted throughout the book. Catherine did change up from her own voice ever so slightly between the cast of characters. For some reason just the way she narrated the book in a melodic and even tones throughout the book was hypnotic. Don’t get me wrong it is not that I did not enjoy her reading but, quite the opposite. It kept me listening and finished it in 2 days. It fit the books tone throughout. When there was a scene of immense urgency she relay that tone. If the character (which was Sarah most of the time) angry, frustrated, crying or solemn she hit the tone of her voice dead on. Even threw in some singing. Very pretty voice. If you are into treasure hunts mystery, I feel that you will not be disappointed. This book to me is like a sleeper movie. Once the word is out more and more will pass this book along. This book was provided to me by the Author Gillian Hamer. Gillian or no one else has affected the outcome of my review. This is solely my own opinion. Please comment and like my review. Please refer this book to others. Twists and turns great historical novel! Would you try another book from Gillian Hamer and/or Catherine O'Brien? Sure! Gillian's writing is terrific--historical, descriptive, poignant. great mystery--a rare find these days. I loved Catherine's accent. i xant' pinpoint one part, but I really sarted to get into the book when Sarah went home to bury her father. I loved all the Wales scenes. Have you listened to any of Catherine O'Brien’s other performances before? How does this one compare? I have not, but will! Defiiniyely--I bet the scenery will be beauiful. A present day mystery based on an actual historical event, the story sometimes as life is pretty hard on your feelings, but it kept the reader on the edge of the seat. The treasure hunt and paranormal aspect (not usually something this reader goes for), was interlaced well and added to the story. The narration was well done, and particularly liked the well pronounced Welsh locations. I heartily recommend to any mystery fan! This is the first book that I have read by this author and I plan to read more. The story is an interesting mystery, and the historical and paranormal elements were neatly woven in. I don't usually like a ghost story, but in this case it was well done and not the main focus. There was an interesting plot twist at the end that I did not see coming. The performance was very good and added to the overall enjoyment of this book. If you could sum up The Charter in three words, what would they be? What about Catherine O'Brien’s performance did you like? she has a nice voice to listen to. I don't know whether the pronunciation of the very difficult Welsh words is correct , but for a non Welsh person it sounded right. I really enjoyed this audiobook version of The Charter. Right from the start the story grabs your interest, and keeps it going throughout. Athriller mystery , with a touch of ghost story . The main Character Sarah is taken on a historical treasure hunt by her dead father ,underway there are which then results in several murders , which then results in questions being asked about her father's death. The book is narrated by Catherine O'Brien, she has a pleasent reading voice, although I found her narration little "iffy" at the beginning, but she soon settled down as she got into the book . this is a book I can thoroughly recomend .